Israeli Right leads Left 63 to 57 - but Likud still in second, trailing by four seats in last day of polling before election. As pollsters release the results of their final surveys before the ban on the publication of new polls goes into effect this weekend, a new poll shows the Israeli Left gaining slightly on the right-wing – religious bloc just days before the April 9th election. 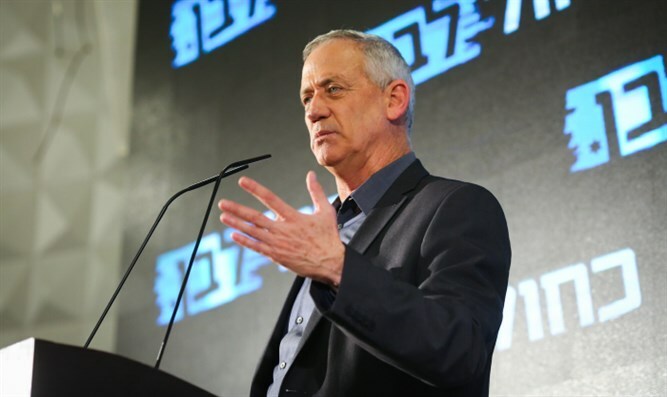 According to the poll, which was conducted by Midgam and published by Yediot Ahronot Friday morning, the center-left Blue and White party of Benny Gantz and Yair Lapid would become the largest faction in the 21st Knesset with 30 seats, compared to 26 for the Likud. That marks a four-seat decline for the Likud compared to the 30 it won in 2015, and is the party’s poorest showing in any poll since March 25th, when the Likud was projected to win just 25 seats. The expanded right-wing – religious bloc would win 63 seats if new elections were held today, the poll showed, down one seat compared to the previous Midgam poll. The combined left-wing – Arab bloc inched up from 56 to 57 seats, thanks to a gain by the Labor party, which increased from 10 to 11 mandates. The far-left Meretz remained stable at five seats, while the center-left Gesher continues to fail to cross the minimum threshold. Among the Arab factions, the Hadash-Ta’al list would win seven seats if new elections were held today, while the United Arab List-Balad ticket would win four. The New Right party of Naftali Bennett would win six seats, while the Union of Right-Wing Parties, the libertarian-leaning Zehut, and center-right Kulanu would all win five seats – identical to the results of the previous Midgam poll. Yisrael Beytenu, however, would fall from five to four seats, the poll shows. The two haredi factions would remain stable compared to the previous poll, with seven seats for United Torah Judaism and five for Shas.